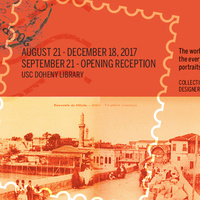 The exhibit consists of a collection of Armenian-themed postcards from Ottoman Empire. All of the postcards are pre-1915 and were meticulously collected over the years by Orlando Carlo Calumeno. As a collective these postcards stand as a reminder of a way of life that was interrupted. The postcards are juxtaposed with photographs taken by Brazilian Armenian photographer Norair Chahinian who had traveled to Turkey in 2015 and a century later had documented the spaces that once were occupied by Armenian life and now are empty.